Vietnam Veterans of America, Michael J. Novosel, M.O.H. Capitol Chapter 542 is taking on the challenge to assist the Indiantown Gap National Cemetery put a wreath on every grave this year during the holiday period from December 14th through mid January. Your sponsorship to our Wreaths Across America Program will help us do just that. Download and complete the online brochure and help us do our part. The Cemetery goal this year is to receive and place 41,500 wreaths. 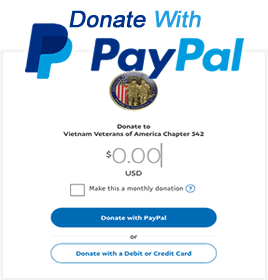 directly to our Chapter using PayPal. Tickets are on sale now! 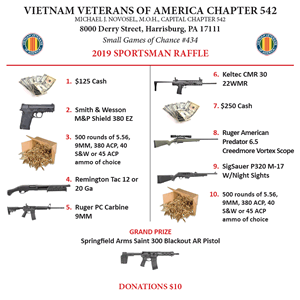 See a member to buy your tickets which will be on sale through 1 September, 2019. Drawing is scheduled to be held 8 September, 2019. Winners will have thirty (30) days from the drawing date to claim their prizes. If prizes are not claimed within that period an alternate ticket will be drawn. In Vietnam, where he flew “DUSTOFF” (medevac) he was awarded the Medal of Honor for a mission where he made 15 separate passes into heavy fire to save 29 trapped soldiers and was wounded in the action. In Vietnam he flew 2,543 missions rescuing 5,589 wounded. He logged 2,038 hours of combat flight time. At one point he served with his son, Mike Jr., who was also a pilot, and they ironically got to rescue one another within the same week after each was shot down. Both served in the 82nd Med Det with our chapter President, John Travers, and through that friendship, Mike became very friendly with our chapter, often visiting and supporting our efforts. He loved central PA and Harrisburg in particular.After his passing, and with the assent of his family, our Chapter adopted his name as part of our own. We carry it with the utmost pride. By doing so his inspirational leadership, unflinching bravery, devotion to family and country, as well as his quiet determination become constant reminders of what we hope to emulate in our activities.